Instead of three years, the number of service years of a prior provincial for the Provincial Chapter of St. Ezekiel Moreno have been extended to four years. This was announced last on the day of the elections for the new set of chapter officers. The results were out last February 22. Fr. Dionisio Selma, OAR was re-elected as Prior Provincial. 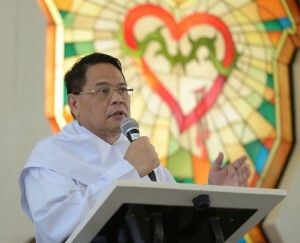 He secured 22 votes from the 27 voting capitulars including Fray Cristopher Maspara, OAR (the Educational Apostolate) and Fray Jaazeal Estelou Jakosalem, OAR (Religious Brother). Tailing behind Fray Selma were Fr. Leander V. Barrot, OAR and Fr. Lauro V. Larlar who garnered 3 and 2 votes, respectively. For Fr. Reynaldo Jaranilla, OAR, this chapter’s election is something idiomatic because it was the first time that there was a 100% return of votes. This meant that out of the 146 voting religious, the same number of members casted their votes for the election of the ternary, a shortlist of who will be the top 3- voted candidates for Prior Provincial election. “Out of the 146 voting religious of the province, everyone voted. During the previous election (6th Provincial Chapter) there was only a 97.24%,” says Fr. Jaranilla. Bro. Jaazeal Jakosalem collecting ballot during the election of the Prior Provincial for the 7th Provincial Chapter of Saint Ezekiel Moreno. On 2016, the “Lamp,” a light and mission project of the order, attempted to deliver information in three languages, but it was only for the general chapter. Right now the Provincial Chapter, though are not obliged to do the same as the general chapter, is intensifying its efforts of also using the three official languages. “As much as it affects the whole order, we wanted it trilingual because our light and mission project of the order has always emphasized that in every important document, not just in events, it has to be translated into three major languages,” says Fr. Jaranilla. “Brazil is Portuguese speaking; Spain and Europe countries are primarily Spanish, and America and Philippines speak English. These are the three areas where we are more present,” Fr. Jaranilla added. 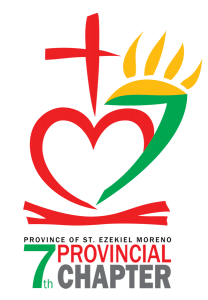 This is official logo of the 7th Provincial Chapter.The presence of a book and a heart signify unity and solidarity. The color red that symbolizes the Augustinian passion to serve God and His people. Another notable symbol present in the is the number ‘7’ which indicates the seventh time that this youngest province of the Order convened its Provincial Chapter.